Flowers for Foodies: You are what you eat? When last we met, I made a promise about squash blossoms. These are lovely things and when I see them on restaurant menus, I am always captivated. Generally speaking, I really like the idea of eating flowers. This may be silly but I do. A flower is a thing of beauty and I happen to like the idea of eating things of beauty. Especially if it is true that you are what you eat. You probably won’t find squash blossoms in an ordinary grocery store. If you do, I would not advise buying them unless you are going to pulverize them into soup. They could not possibly be fresh enough for stuffing. I found mine at one of my favorite local farmers’ markets. Squash blossoms are extremely perishable and difficult to keep. It is best to prepare and serve them on the same day they are picked, especially if you are going to stuff them. Mine had been picked the morning I purchased them and even still a couple were so badly bruised that I had to toss them in the compost bucket! Don’t you just hate that? You can see in the photo how beautiful they are. They have these delicate green veins – look closely. Mine were female as they had small squash attached which I removed for another time. The flowers tend to be about 4 inches in diameter and about three inches long. This leaves them with plenty of space to put some filling. Apparently, squash blossoms open up early in the morning. One article I read encouraged picking them at that time so they would remain open and be easier to stuff. I had no problem gently coaxing mine open to get them ready for filling. I carefully washed them out. In one, I found a little bug. Unlike flowers, I am not interested in eating bugs. I also removed the stamens. Why? Because several recipes suggested that this part tastes bitter. It was easy to do. I just stuck the tip of a small kitchen shears inside and carefully clipped it away. Most of the recipes I found called for stuffing the flowers, coating them in some way and then frying them quickly. Some called for a simple dusting with corn starch or flour and others suggested using a batter. I decided to use the same basic batter I use when making Mexican style chile rellenos only with different seasonings. Here is the mis en place for the batter: a separated egg and a little bit of flour (mixed with some onion powder, salt and pepper). I also decided to use a fairly mild filling because the blossoms are hardly about flavor. With a lightly seasoned batter fried just so, this dish is so much more about mouthfeel than anything else. My meal consisted of polenta with guanciale and sous vide duck breast with a cherry gastrique in addition to the squash blossom rellenos. This dinner was a wonderful study of contrast in texture and taste: crispy and subtle vegetables set off against the meaty poultry with its pungent, fruity sauce and the creamy, bacony polenta. To make the filling I used fresh ricotta flavored with preserved lemon, fresh mint, thyme, just a touch of basil, and some salt. I plucked the herbs from my garden – some of the few things I can grow in spite of my cursed black thumbs. I finely minced the herbs in the small bowl fitted to my immersion blender (still my favorite kitchen implement), added the other ingredients and gave it a couple of pulses. I ended up with a lovely emulsion though I wish it would not have thinned out so much. Next time I might add some flour or walnuts to bind it a bit. To make the batter, I whipped the egg white until it was stiff but not dry, folded in the yolk which I had stirred well and then sprinkled on the seasoned flour. The flour was then lightly folded into the egg mixture, keeping the batter plenty light and fluffy. Earlier, when I opened and cleaned out the blossoms, I set them on some plastic so by the time I was ready to prepare them for frying, they were pretty dry. As I filled each blossom with the cheese mixture, I brought the petals together and gently pinched them between my fingers just enough to keep them closed while I slathered them with the batter. The batter more or less “glued” the petals together so the filling did not come out during frying – at least most of the time. I fried them up in very hot, but not smoking, canola oil. Canola works well because of its total neutrality. The frying went very fast – it took maybe a minute or two to get one side a nice golden brown. I flipped them over with a spatula, rather than a pair of tongs, to avoid having them break open and spill the filling. They came out looking really good. I lost a little filling from one, but it was still fine for serving. Our dinner was lovely and romantic. We had great fun taking bites of the three dishes and experiencing the different flavors and textures. A couple of notes: Sour pie cherries have about a 3-4 week season here. I picked 25 pounds this year and canned them all. I made the gastrique from some juice that was unused after I had canned all the fruit. It was mildly sweet and intensely cherry flavored. After reducing the juice to 1/4 of its original volume, I amended it with some 18 year old balsamic vinegar and a tablespoon or so of honey. The polenta was actually left over from a meal we had earlier in the week. While it was in the fridge, the guanciale permeated the cooked polenta in a wonderful way. It tasted even better the second time around! 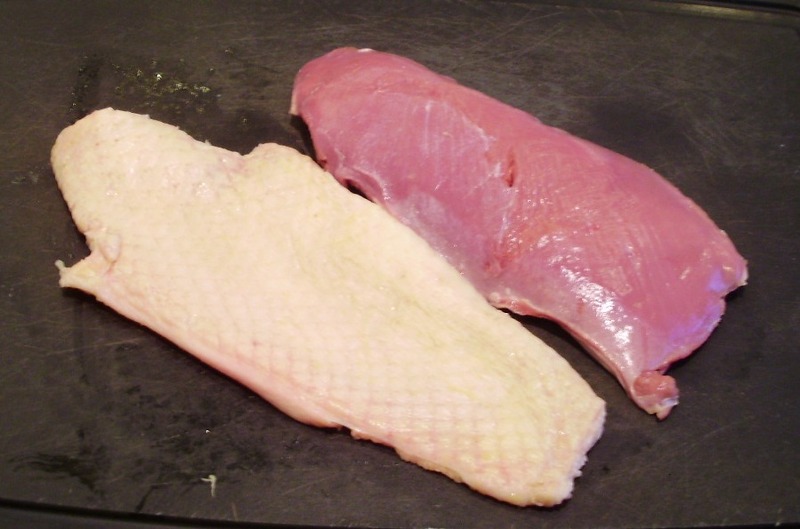 The duck breast was cooked in the same manner described in my earlier post here. A few posts ago, I showed you box containing a cooler full of duck that I found on my doorstep one day. Well, I didn’t really find it, I ordered it from HVFG without having the foggiest idea of what I was going to do with it once I had it. A number of folks congratulated me on my purchases, and one person even expressed duck envy, but no one came up with any suggestions for what I ought to do with all or any part of this booty. Oh, what’s that you say? I am supposed to tell you what to do with it. Moi? Well, for future reference, if while reading about my culinary exploits you find yourself thinking “I would have done something like this …, or “why doesn’t she just do…”, please feel free to leave a nice comment. (“Hey, stupid” is not gonna fly for me.) Kathy recently did just that (left a nice, polite and informative comment) on Pi day and I very much appreciated it! OK, it was fairly crappy, IMHO. I cooked it too long and too hot. It was in the SVS for 4 hours at 59C (138.2 F). It was just a little too well done, at least for me since I like my duck on the more rare side and this was decidedly medium. Additionally, it was not the right texture. I could tell that I had cooked it for too long because it was too tender. It was not quite mushy like the expensive, grass-fed flank steak I destroyed, but it completely lost its steak/meat-like quality. My family, including my sweet, adorable, darling, teenaged, step-daughter, who is the pickiest eater on the planet, didn’t notice. Hubby and she ate it quite happily. I think it was the cherry and honey demi-glace together with the crispy, bacon like skin that I garnished it with. I will tell you how to make that below. I served a rocket salad with watercress on the side. It looks terrible in this photo. But trust me, it was not drenched with dressing or wilting as it appears. Note to self: don’t dress the greens before the photo, simply spray them a tiny bit to get a shine. 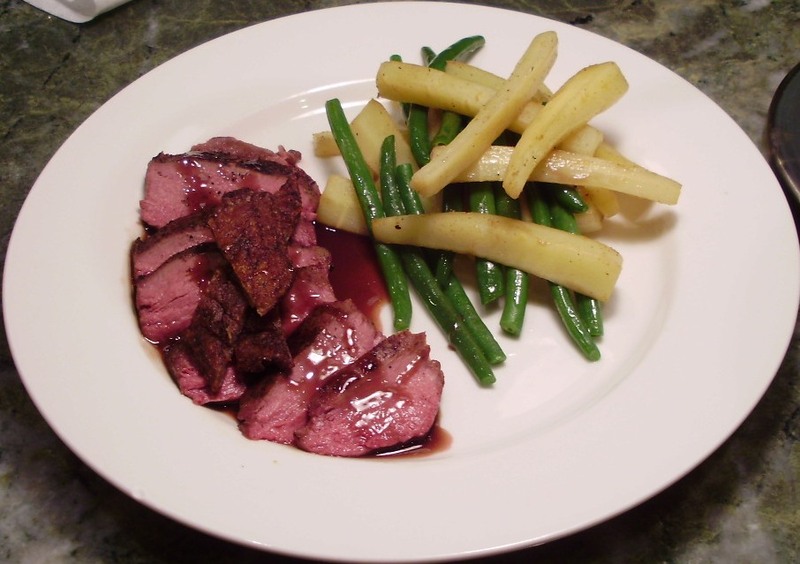 I actually used a delicious, very mild lemon juice and olive oil emulsion to dress the greens, which was a nice complement to the rich duck and its sweet sauce. I removed the skin from the breast meat. It was easy to do. All I had to do was carefully pull it away. In a couple of places I had to use my handy-dandy boning knife to help me out, but not much. I reserved the skin, wrapped in plastic, in the fridge. I cooked the duck this time around in the SVS at 57.5 C (135F) for one hour and 15 minutes. This was exactly right, as it turns out. It came out perfectly medium rare and it retained its steak-like quality. 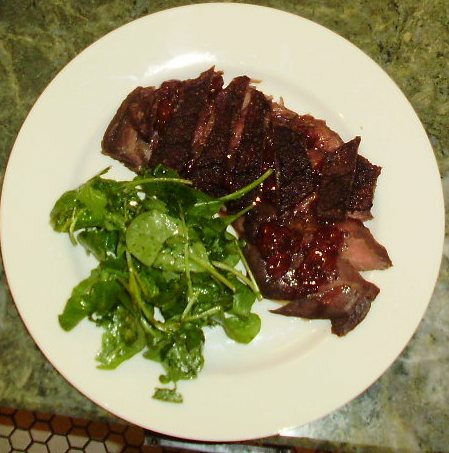 There was nothing tough or chewy about this duck, it was plenty tender and easy to chew. But you definitely knew you were eating some good meat. 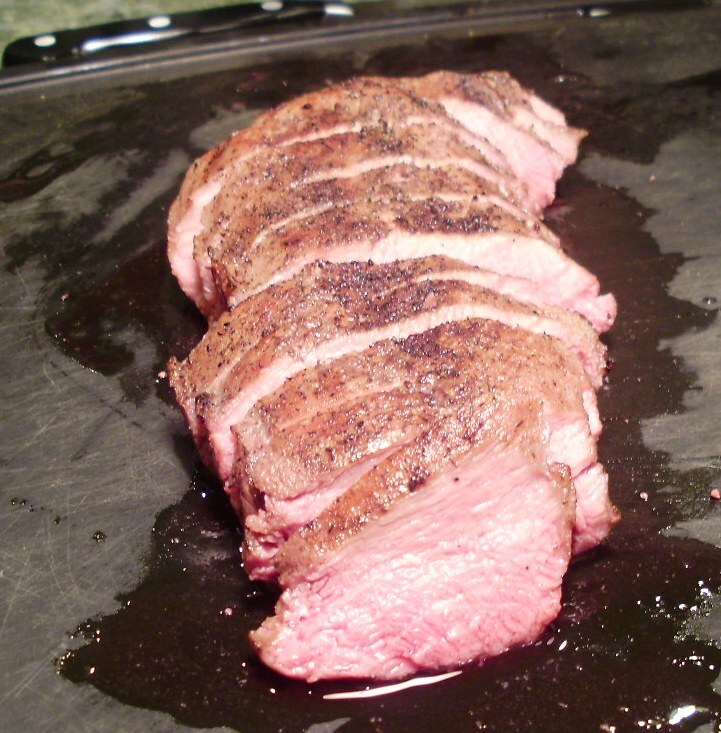 When the duck breast was ready I took it out of the bag and patted it dry with a paper towel. Now this is the exciting part. I already told you that I am a serious apparataphilliac (pronounced: ap-uh-rat-uh-fil-lee-ak). I especially love kitchen gadgets. So, for the first time, I got to use my new blow torch. It was quite the thrill as you might imagine! Food comes out of the vacuum bag and water bath cooked evenly, all the way through. No one part is more done than another because NOTHING can get hotter than the temp of the water. It’s brilliant! This, to my mind, is the number one benefit of this cute toy. However, we the eating public have a preference for food, in particular protein, to have a nice “crust” on the outside, an area that has been carmelized or “browned” as my mother used to say. This is called the Maillard Reaction and it is all about a complex chemical change that occurs when you touch food with high heat. I highly recommend you read Dr. Baldwin or Harold McGee, if you really want to know more about this. Suffice it for me to say here that there are several ways you can accomplish this. The easiest and simplest is to just heat up a good heavy skillet with a light coating of some neutral, high smoke-point oil (I like grape seed, Thomas Keller likes canola) and toss that baby in the pan on the “show side” for no longer than a minute. Just don’t do your tossing until the oil barely begins to smoke (then, watch that sucker like a hawk) because you will risk overcooking the protein – the precise problem of using the skillet. You don’t want to do that, now do you, since you spent so much time and money figuring out how to cook it evenly throughout, sous vide in your water oven? 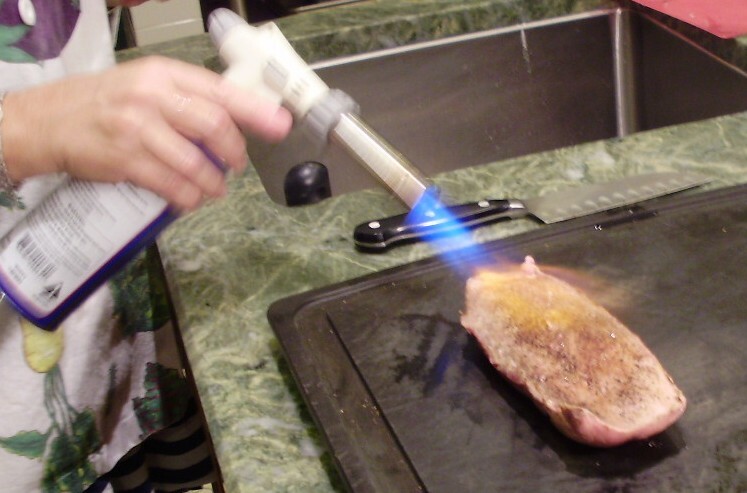 Another way to get the Maillard reaction is to use just the right tool (aka gadget). This is where my endorphins kick in, big time. There are a number of different kinds of torches you can use for this purpose, mine is the Iwatani Pro. This is the guy they use in the big leagues. Don’t bother with those namby-pamby creme brulee torches (wanna buy mine from me) they work only for that one purpose and they don’t really do that too well, either. And besides, the big (well, more like medium) Bertha is much more fun! This time I served it with a much milder, not so overwhelming, sauce. I made it from a very hearty clear chicken stock I had on hand. To the stock I added miripoix (that’s French for diced carrots, celery and onion which gets sautéed in a little butter) and a sachet (that’s French for a little bag) of a sprig of parsley, a sprig of thyme, some peppercorns, a couple of cloves and a bay leaf) and reduced the liquid by half. Next, I added some blueberry syrup (I made that last summer from hand picked blueberries and sugar). While that was reducing, I carmelized a shallot, deglazed it with Cointreau and then strained in the reduction. I strained the sauce one more time to get rid of the little shallot pieces and voila! The veggies you see are parsnips glazed with nutmeg infused brown butter and haricots vert. I got the inspiration for the parsnips from one of the many wonderful food blogs I read. Here it is plated and sauced and ready for feasting on. Now, finally, I’ll tell you about the crispy skin I garnished the otherwise healthy and very low-fat duck breast with. I dried that sucker off again real well with a paper towel and rubbed it down with my favorite-for-duck Chinese 5 spice. I scored it in a diamond pattern and placed it in a skillet with bacon press on top, turned on the fire and let it rock. Watching it very carefully as it turned the entire stove top into a greasy mess, I fried that skin until it was just like crispy bacon. The whole piece of skin was crisp and most of the fat was rendered off. I drained the skin between more paper towels, weighting it down once again with the still hot bacon press (wiped off) until I was ready to cut it into strips for the garnish. Really, this was just to keep it warm. The end result was unctuous, yummy, deliciousness in a small enough quantity (it’s just a garnish, after all) to keep you from feeling too guilty. Bon appetit! Soon come, mon: Chicken pot pie? 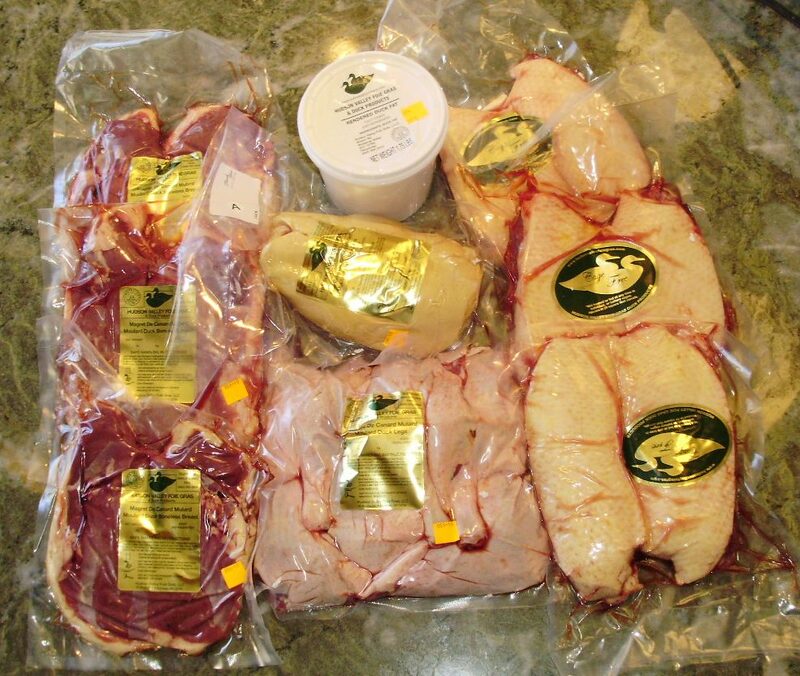 Fanatic Falls For a Flight of Fancy: Duck, that is. That’s my darling husband. (I purposefully cut off his head so he could stay incognito and so I could get you to focus on the box.) 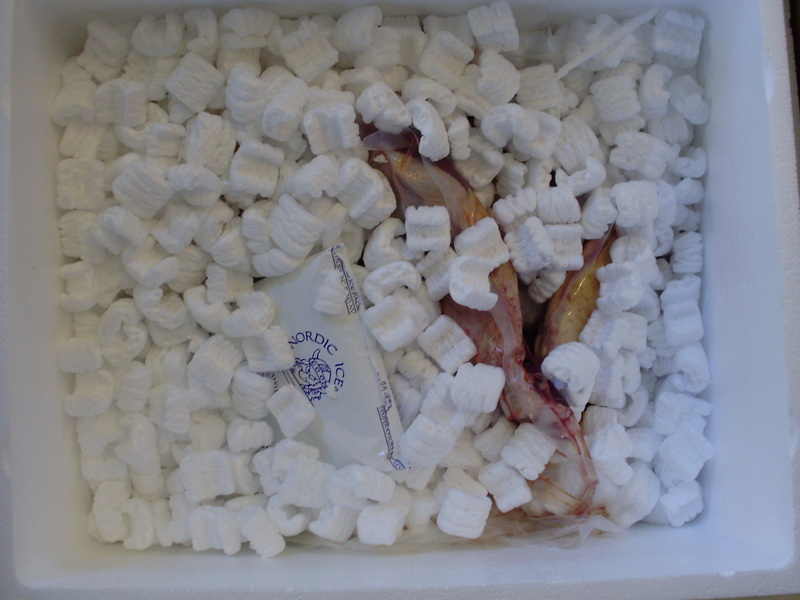 That’s the box sent to me after I placed an order with Hudson Valley Fois Gras. I was surprised that they just left it at the door and did not even ring the bell. Thank goodness I was home and watching for it! 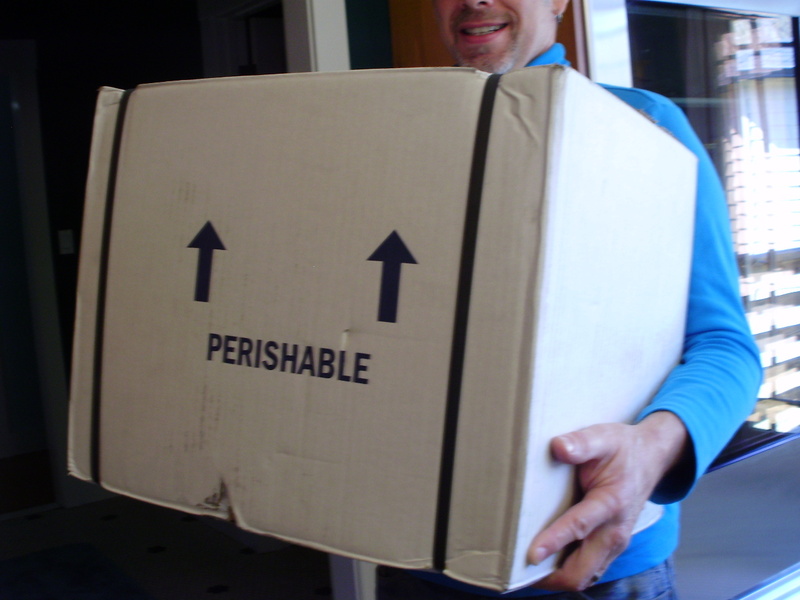 They make you pay for overnight delivery cause the stuff is really fresh. Needless to say, I didn’t have any issue with this. So, what’s a girl to do????? ?